Spring is just around the corner. 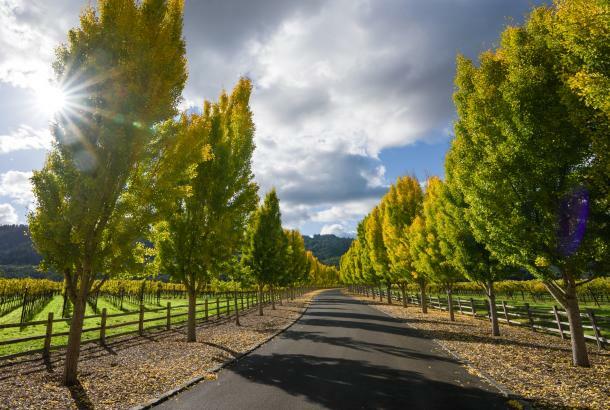 After the heavy rains of winter, it’s the perfect time to experience the Napa Valley en plein air – the vineyards are overflowing with yellow mustard blooms and fruit trees are exploding with white, pink, and coral blooms. From early spring until late fall, seeing the valley au natural is the way to go. And there’s no better way to do that than by bicycle. 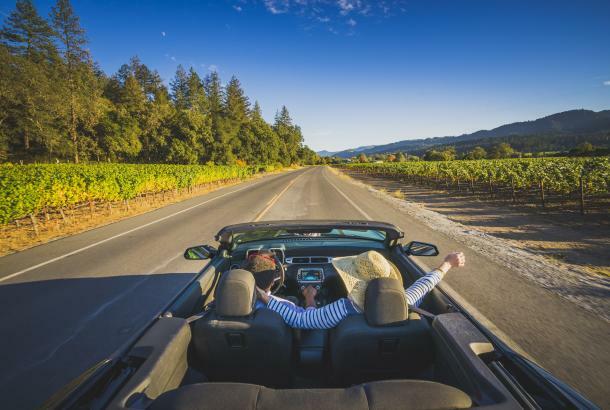 Whether you’re traveling solo, as a couple, in a group of friends, or with a passel of kids, you should check out the Napa Valley Vine Trail. 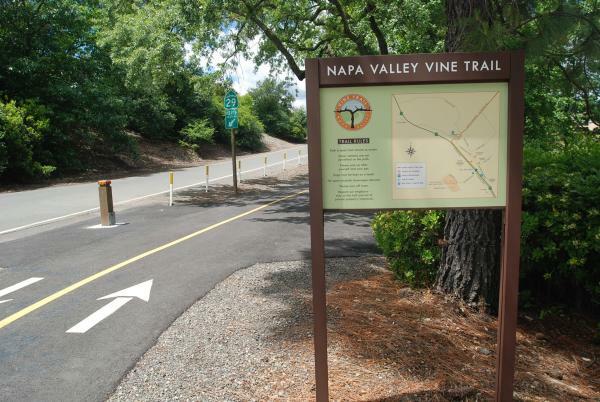 The coalition that built it is a local nonprofit that aims to construct a walking/cycling trail system that will connect the entire Napa Valley. Upon completion, there will be 47 safe and continuous miles of level, paved, dog-friendly trail stretching from the ferry terminal in Vallejo to Calistoga. More than 300 trees have been planted that will eventually shade trail users. Interpretive signs call out special areas of interest. There are shelters for rest stops with bike racks and bike work stations, maps, and other information. And mileage markers indicate your progress. At present, the continuous section goes from Kennedy Park in south Napa to the north end of Yountville in the valley’s center. Here are some of the things to see and do along the way. If you want to do the entire trail, start your ride at Kennedy Park, a public space on the Napa River with softball fields, sand volleyball courts, picnic sites, and a formal garden. 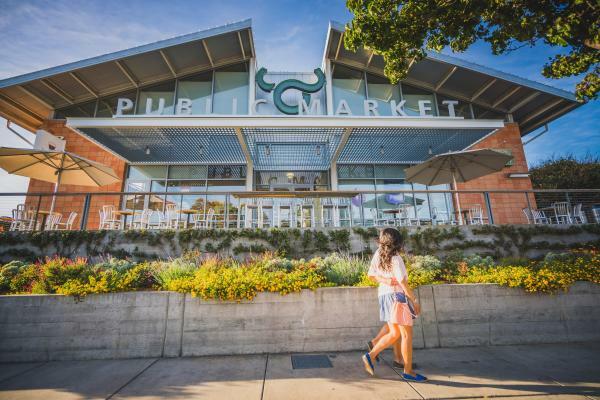 From there, ride 2.5 miles north on the trail to Oxbow Public Market, a bustling food hall that features restaurants, vendors, local produce, and a riverside deck overlooking the “oxbow” in the Napa River. This is the perfect place to stock up on snacks for your ride. 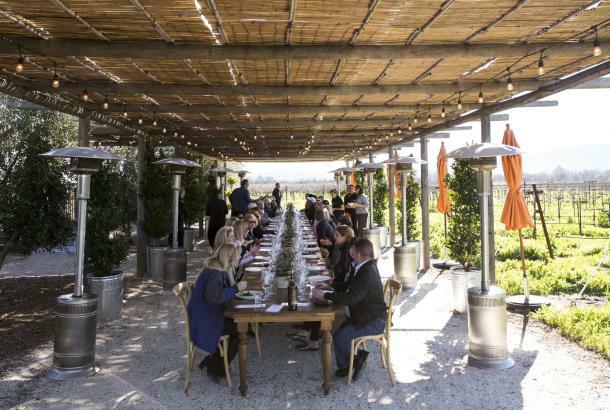 Then head north half a mile on McKinstry Street and Soscol Avenue to see the Rail Arts District (RAD Napa), which is a free outdoor contemporary art installation that runs for two miles along the Vine Trail. 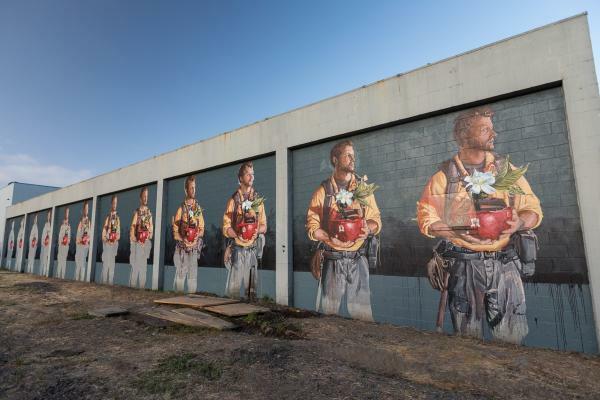 Murals, sculptures, landscaping, and parks are transforming these semi-industrial areas and neighborhoods. Now ride 5 miles north. If you’re up for a small detour, take a left on Trower Avenue and head two miles east to Alston Park, 157 scenic acres of hiking trails through grasslands, meadows, groves, a canyon, and a creek. It’s also home to Canine Commons, a popular off-leash dog park. Back on the Vine Trail, ride 5.5 miles north to Yountville. You’ll be riding parallel to Highway 29 through the center of the vineyard-covered valley floor. 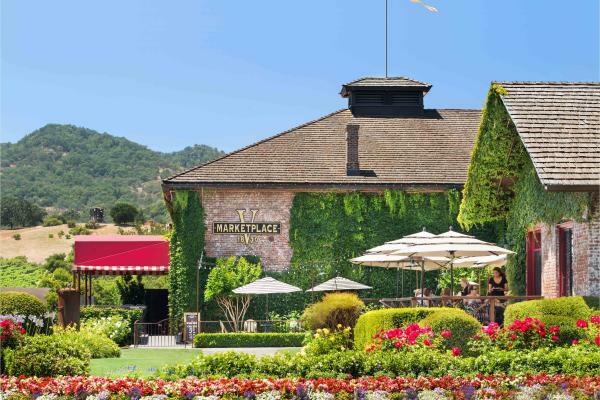 When you get to Yountville, another optional detour: Turn left on California Drive and right on Presidents Circle to get to the Napa Valley Museum, an excellent local heritage museum featuring regional art, science and history exhibitions, and educational programs. Head back the way you came and in one mile you’ll be in downtown Yountville. This town is small, but packed with wineries, restaurants, and shopping. 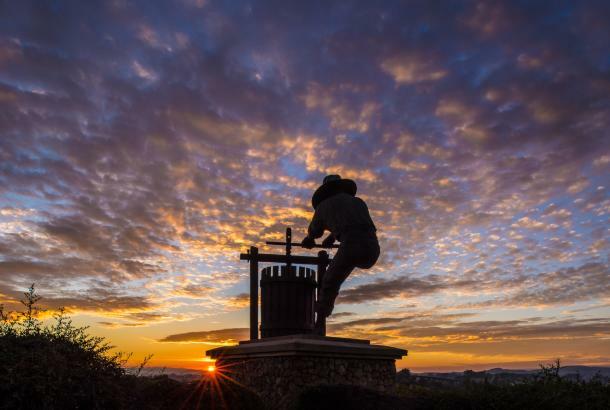 For some wine tasting, try Girard Winery, Stewart Cellars, Priest Ranch Wines, Handwritten Wines, or Hill Family Estate. Or do a little boutique browsing at V Marketplace, filled with a variety of charming shops. For a takeaway lunch and ooh-la-la pastries, it’s worth waiting in line at Bouchon Bakery. Then take your goodies, get back on your bike, and ride the half mile north to visit the George C. Yount Pioneer Cemetery and Ancient Indian Burial Grounds. 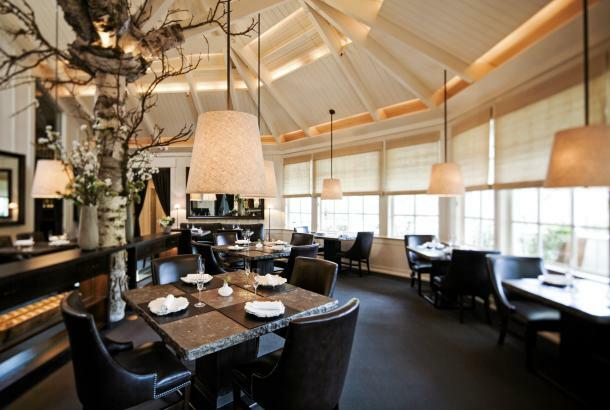 Or, if there are kids in your group, Yountville Park is a great finale. Congratulations! 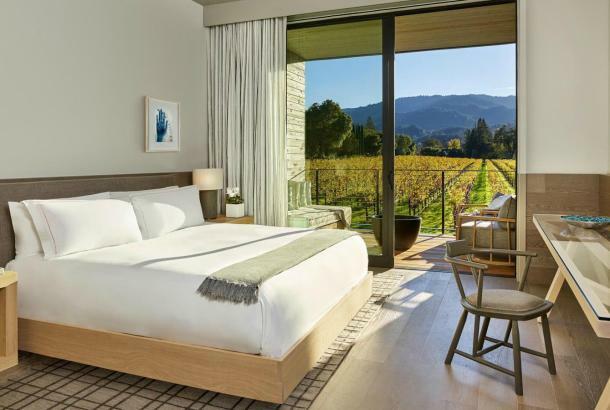 You’ve just gone roughly 15 miles and experienced a rich slice of Napa Valley’s wineries, shops, and local attractions. 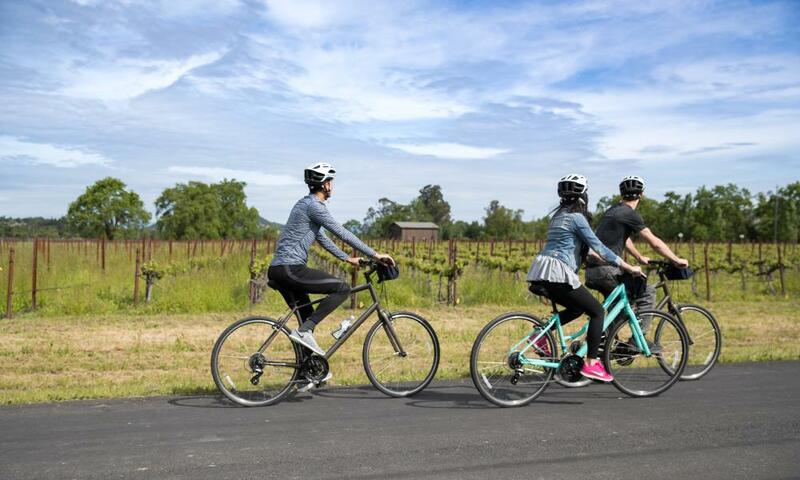 If you didn’t bring your own bikes or only want to travel the trail one way, Napa Valley Bike Tours has shops at both Yountville (6500 Washington Street) and downtown Napa (950 Pearl Street) locations. They charge a $10 relocation fee for one-way trips, and also have electric bikes for rent.